Get out all your holiday books and wrap them up today! You can even have your child help you, I know mine love to help put the tape on. If you don't have 24, don't worry - just take a trip to the library to borrow a few more. Of course, just be sure those library books get unwrapped before they are due back! 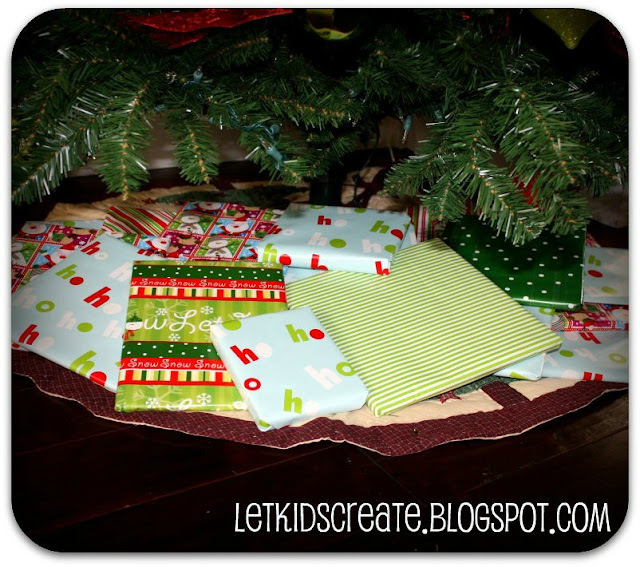 In order to tell which books will need to be read sooner, you could wrap those books in a different wrapping paper than the rest or even give the books a number like Lorie did over at Reading Confetti. Each day have your child unwrap a book and read it together. My girls will be taking turns each night unwrapping the book. We have done this for the last two years and my girls have really looked forward to it. Will it be fun for my child if I decide I don't want to wrap the books? Of course, to a child, unwrapping gifts is one of the great joys of the holiday season. But the most important thing is that you are able to sit and share some meaningful Christmas stories together each night. It would be just as thrilling to find a different book each day under the tree without the wrapping. Does your local library seem to be depleted of Christmas books already? Last year when I went to pick out our books the Christmas book supply was very low. None of the books that were left were anything we wanted to read. If you find that is the case at your library, try looking in the fairy tale section for books that haven't "officially" been declared as Christmas books. Several versions of The Elves and the Shomaker, The Gingerbread Man, etc. can be found in that section. Another type of book to look for is anything winter or snow related. Or even a non-fiction book about reindeer that isn't necessarily deemed to be a Christmas book. Be sure to check back each day as these 24 bloggers count down to Christmas! Thank you for starting off our Creative Christmas Countdown with such a lovely idea. My girls are always excited on December 1st as it means all our favourite Christmas books are brought out again, but I'd never thought to wrap them up. Thanks for the idea! We will be going to the library to do this today! Fun idea. Thank you for a great start to the Creative Christmas Countdown and what a great idea - I looked at the library last week thinking to get ahead of the game but there was nothing there :( now I have some added inspiration of books that we could get as well. What a fun idea! I may have to see if I can round up 24 books! I am so glad I didn't get the Christmas books out yet! I love this idea and can't wait to get busy wrapping!!! This is such a great idea! I did this last year but I bought all of the books, geez that can break the bank! I love love love the idea of using library books! I can't wait to go pick ours out! Well done Brooke! A great kick-off! I love the idea of using non-fiction books, this will really appeal to my 8 year old daughter. Thanks for sharing this lovely idea. I have my books out sitting next to me right now and got the cutest wrapping paper to cover them with. I like you idea of wrapping the library books in a different paper so you know to get them unwrapped faster. I was amazed that I had 24 good Christmas books right at home. I usually buy the kids a book each year and they have finally amounted to something. I love this idea - we have nothing like 24 Christmas books but well really enjoy wrapping what we have and building on that Christmas collection - top start! we also wrap our Christmas cds/movies. With 3 kids, that way each one gets to open something each day! Thanks so much for posting this ideas. The library open in 15 minutes and we're about to head out the door! THANKS! This is what we're doing!! Of course, I have to wrap all the books before story time tonight....but I do have them & the tree is up! There were only two shelves of books left yesterday. There must the lots of families doing this here this year. Great post! We are going to find our Christmas books tonight and start wrapping! This was a wonderful way to start the countdown! You did a great job of kicking it off and I love this idea. Thanks so much for sharing! I don't think I have that many books, I will have to go and look because I love this idea. Thanks for sharing. I am participating in a different Christmas blogshare, the 25 Days of Christmas Blogshare. Today I shared our Advent Countdown Tree. If you have a chance would you consider linking this post to our linky. We started this today too as one of our 5 advent calendars! SO excited to see what else is shared during the 24 days of holiday magic! Borrowing some from the library is a great suggestion! What a great idea!!!! No one ever thinks of wrapping things that are not new! Awesome idea! Now why didn't I think of this when my children were young! Thanks for joining the 25 Days of Christmas Linky! Feel free to grab the pic and post a link on your site! Our church library has a lot of Christmas children's books. Yours probably does too. Thanks for lots of good ideas. We are doing this! Our elf brought the books. The most amazing part is these are books that she has read and would "normally" remember but the magic of Christmas and a child's innocence makes each book she opens so exciting and new. I love it! Thank you so much for this wonderful idea. We are enjoying it so much, I can already tell it will be a treasured tradition for years to come.